Here how Ivan went from pursing rap to making pottery then chocolate. 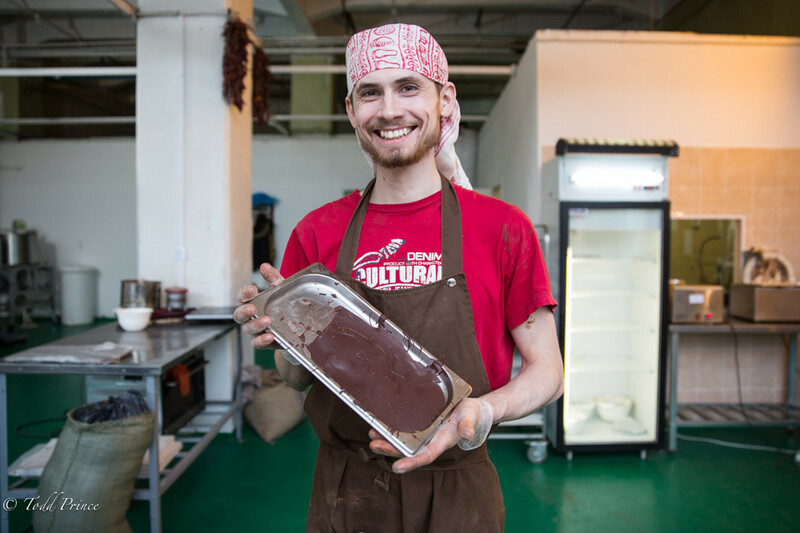 MOSOCOW: Ivan, 27 and a Vladivostok native, hand makes chocolate in a former Soviet factory in Moscow with his girlfriend Dasha, who was doing the evening shift after him. Ivan, who was raised my his mom and older sister, said he moved to Moscow for a second time in 2013 to pursue music. He explained that he fell in love with rap as a teenager in Russia’s Far East after having randomly bought an Eminem cassette at a kiosk some 15 years ago while bike riding. Ivan said he then met Dasha, also a Far East native, through social media in the autumn of 2013. They only met in person in 2014 as she fly through Moscow on route to India. She would later that year move across 7 time zones to be with him in Moscow. Dasha loves making pottery and found work in Moscow producing ceramic vases and dishes. Ivan said he came to visit her at the shop, enjoyed the process and gave it a shot. Dasha then found the job making chocolate at the factory and brought over Ivan. The two switch shifts, overlapping two hours during the day. Ivan still pursues music after his chocolate shift….and occasionally makes pottery with Dasha in their free time.